Stand out as the best by far. To topple Goliath, you need to stand out from the crowd. Unquestionably, the key element is to provide a unique customer experience that is far better than anything out there already. It isn’t enough to look different or act different. Your company must truly be different. Your product or service must captivate the market in a whole new way that the big guns cannot. Michael Dell transformed the industry by creating computers that were genuinely personal: mass-manufacturing individually made-to-order computers, bypassing the middle man by selling directly to customers, and empowering customers to order PCs online themselves. Central to Southwest Airline’s strategy and success story were quirky service and regional airports. Outsmart your bigger competitors. David and Goliath is a classic case of intellect and strategy outwitting strength. 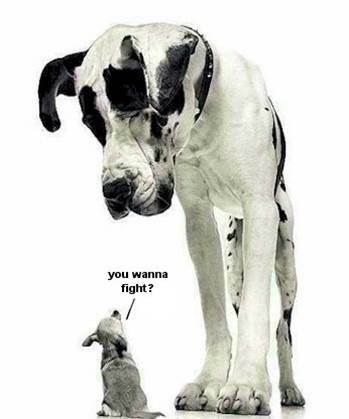 Too often, market leaders try to muscle out their smaller competitors with strong-arm tactics. Not all start-ups are defeated by this. The smarter ones study their larger competitors well and know their Achilles Heel. Then when the market giants least expect it, the start-up can outwit them when they’re down. The quickest mover gets the reward. Business is full of examples of the sizeable, sluggish market leader being slow to react to market changes, while the lean, agile start-up seizes the gap and disrupts the market to become the new market front-runner. Think of the digital camera bankrupting Kodak. Nowadays, every established company faces the risk of having its industry – and its own business – disrupted by a start-up. Your entire industry can be transformed in the space of a headline. If your business cannot innovate, it won’t survive when the start-up in the garage across town, that doesn’t have to answer to your shareholders, does all the things your legal team has been telling you not to do, all the things that you overlooked. Even if you’re the market leader, your business needs to think and act like a start-up. Partner to get to market first. If you’re a small start-up without budget, how do you bring your offering to market first, ahead of the big corporates with deep pockets? A great strategy is to partner with others. Compaq trumped IBM to market with the launch of the Deskpro 386, the world’s first computer to use Intel´s new 80386 chip. Later, Dell went on to beat Compaq with a similar strategy and in fact the identical partner, Intel. If you’re looking for partners, don’t forget universities. They are fantastic sources of often-undiscovered innovators and innovative technology looking for a route to break into the marketplace. Start in the right niche. The common assumption is that niche means small. But this doesn’t have to be the case. Starting with a niche is one of the most effective routes to eventually toppling the industry giants. The key is to find the right niche and market position for your offering. The founders of Google didn’t try to become a global advertising mega power, while Facebook’s Mark Zuckerberg didn’t initially set out to attract a billion members and dominate the world. Search engines and social networks were both niches when they started out. Make the battle public. How can people support the underdog if they don’t even know about the battle? In the 1970’s, a little-known group of California farmers had the daring to believe their wine was as fine as the French winemakers that had lead the global wine industry for centuries. The American winemakers backed up their claims publicly, out-competing the French incumbents in the legendary Paris Wine Tasting of 1976. This competition inadvertently gave rise to the Californian fine wine industry and was later depicted in the movie Bottle Shock. With the Internet and social media dramatically driving down costs of marketing, it is becoming easier and cheaper to get the word out there about your offering. And if your creation is truly unique, special and niched, customers will help spread the word by sharing and making it go viral. The only proviso: you must win the challenge against the big players. Another factor making it easier for small companies to compete against established players is that we just don’t trust big companies like we used to. The fissure of confidence between small companies and big ones is widening. We used to depend on the security of big firms. That was why we worked for them. And hired them. And trusted them with our hard-earned money. Then the global financial crisis hit. With the downfall of AIG (American International Group), Lehman, Bear Sterns, Citibank, General Motors and others, the world has become a different place. Today it is sometimes risky to do business with the big players. We simply don’t have faith in companies anymore. We trust people. And we want to deal with people, not machines. In 2009, Passlogix*, a privately owned 100-man software development company in the US, was awarded more than $1m in prepaid commitments for the coming three to five years of service. And they had out-competed a number of much larger, more established organisations like IBM (400,000 staff), to win those clients. How do you rationalise that? In the tough economic conditions of 2009, bigger firms simply weren’t getting contracts of that magnitude. And Passlogix’s clients only got a small discount for their upfront payment. It comes down largely to trust, and this is where small firms have a massive head-start. Like with Passlogix in 2009, clients of small companies can phone and speak directly with the CEO. They know exactly who to call if the work isn’t up to scratch. For them it is critical to have that personal relationship, that trust. And many clients are willing to invest in it in the long run — with big contracts. While big investment banks may be floundering, small boutique firms are cropping up, with only a handful of staff members each. And they’re doing well. They have gone back to the basics. Finding a niche where they can add value and doing deals focused on their area of expertise. Then meeting face-to-face with the other people in the deal, growing the relationship, making reasonable commitments, and delivering on those commitments. Small firms with low costs, dependable owners, a small number of dedicated people, personal relationships and sustainable business models that generate a realistic profit. These elements build trust. Small and sustainable is the new opportunity. Trust is today’s competitive advantage. Are you and your company positioned to seize the gap? * later acquired by Oracle in 2010.